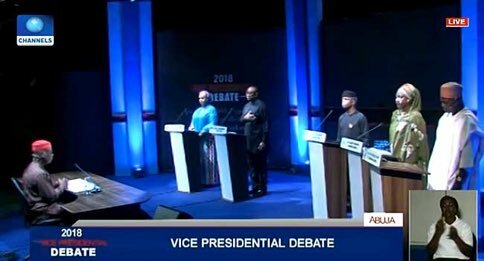 The Vice Presidential debate put together by Nigeria Elections Debate Group (NEDG) and the Broadcasting Organisations of Nigeria (BON) was held at the Transcorp Hilton Hotel in Abuja on Friday night. An independently administered multi-stage process led to the selection of five political parties that partook in Friday’s Vice Presidential debate. Present at the debate were; Ganiyu Galadima of the ACPN, Khadijah Abdullahi-Iya of the ANN, Professor Yemi Osinbajo of the APC, Mr Peter Obi of the PDP and Umma Getso of the YPP. The debate was an interesting one with the Vice-Presidential candidates stating categorical their plans for Nigeria and answering critical questions about the growth of the nation and its future. 5. Umma Getso said there is no party except YPP in Nigeria that has given priority to women. She says Kingsley Moghalu’s administration will give equal opportunities to men and women to serve in his government at all levels. 6. PDP Vice Presidential Candidate, Peter Obi, said Nigeria has become the country with the highest number of poor people in the world. 9. Peter Obi says the Atiku/Obi Presidency is about making Nigeria work again. He adds that their administration will care for Nigerians, especially the youths to discourage them from embarking on perilous journey in search of greener pastures. 10. For Yemi Osinbajo, Nigeria is where it is today because of 16 years of misrule. He, however, says the present administration has taken steps to “repair the damages that have been done” by tackling the leakages in government.